Wow, I can't believe it's been 1 1/2 years since I joined the Elzybells DT ~~~my very first design team! Time flies when your having fun. Today's post is the DT's last official challenge as our term is up at the end of the year. I truly want to Thank you Elizabeth for giving me such a wonderful opportunity. It's been amazing to work with your adorable stamps and I will miss you a ton. But don't worry....just because I am not 'official' doesn't mean you won't see some Elzybells love from me! I also can't wait to see who we're going to be passing the DT torch on too. How exciting for the new team! The challenge for this week was Blue, Silver and White (yep...I thru in just a smidgen of red...it needed it). I heat embossed my Tree Landscape stamp with silver powder. OMGosh I absolutely LOVE the embossed outline! The sentiment is from Bubble Greetings. I stamped and embossed "Merry" twice. Cuteness. To make my scalloped edge I punched 3 ovals and adhered them to the back of the blue cardstock. So easy! You don't need fancy border punches to create that look. Give it a try! Sorry it's been so quite in my blog world. But come back tomorrow as I will have 2 posts ---2 cards to share with you! Have a great day everyone. Tempting textures - use various textures / materials and /or ribbons somewhere on your card. I had alot of fun with this and went a little crazy with all kinds of textures. You can see that I sewed felt on to a block of cardstock and then adhered that to a card base. I used this green GLITTER paper which has a nice rough texture. Then there is the white flocked lace for a nice velvety feel and just look at that trim.....tons of texture there. Let's not forget those adorable little rhinestones. Told ya....I couldn't stop myself from adding more and more. Haha. For my card I went back to my very favorite Elzybells stamp of all time! There is no question that this is the stamp that made me fall in love with Elzybells. It's called A Winter Song and you can find it here. A true must have in my opinion. Hey Everyone. This week Elzybells is having sneak peeks for the release of some incredibly cute Christmas stamps....Thursday October 22. I am currently on a cruise ship and was unable to do this months release with the rest of the design team but I have a big treat for you! My wonderful friend Carly is filling in for me as a guest designer spot this month. She's going to knock your socks off so please go and visit and send her some Elzybells love! Here's the links for you to go see all the wonderful projects that the girls have to share with you. Enjoy! PS....scroll down to enter my little give away. This week our challenge is to CASE another DT members cards. Fun yes, but so hard to pick from all the awesome DT's work. I went with THIS card from Francis and put my own little spin on it. I should also point out the the tree stamp is actually from the newly released Decorating Teddy stamp but I cut the tree out and used it without the little bear. 2 in 1 stamps! Gotta like that. I hope you will play along. CASE one of our cards and be sure to post a link on Elizabeth blog. Please visit the girls to see their CASEd cards. Hey Everyone.....I hope you all enjoyed Elzybells Sneak Peek Release week. We enjoyed creating and sharing with you all. Please hop on over to Elzybells to see the entire release in full and check out the DT's final projects. Here's some more projects I came up with. Have a great day!! I am so IN LOVE with the Bubble Greetings set!! LOVE! Elzybells Sneak Peek --- Day 3!! We're getting close! Just one more sleep for all the new Elzybells to be available. Thanks for stopping by again so I can share a few more cards for the sneak peek. 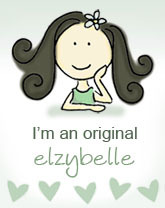 Are you loving the new Elzybells stamps? I'd love to hear what your favorites are. This little witchy is soooo cute! I stamped her and coloured her on some Basic Grey paper (Lemonade collection I believe) and then went over the ink with a blender pen so the look is sort of intentional even though it looks like I coloured like a 3 yr old. Don't judge. haha. One of the sets that Elizabethis releasing is Bubble Greetings...it has sentiments such as Happy Birthday, Merry Christmas done in that great bubble type of font that we all did as a kid when doodling (right Steph?!). It's NOT an alphabet set however I found it had all the letters I required to create "CARE for A BITE" so I stamped them and cut them out. How FUN is that! As you can see with the witch and the dracula I coloured and then cut them out so they kind of look like a die cut (IMO anyway). It's just a nice change from the stamped and layered look. Give it a try and see what you can cut out and pop up on your cards. Now this last card has ZERO cutting or popping up. It's a one layer card (yes Wendy, these are possible!). This card uses 3 new stamps, the Snowflake Frame, Teddy decorating tree and the Beary Merry sentiment. That's it for today! See you all Thursday--for release day!! I bought a HUGE bag of caramels....thinking I will take them to work to share in a candy dish (if they ever make it there!). On the back of the bag there is a recipe for Caramel Apples. What's a girl to do?!! Check it out. My apple tree didn't produce much this year. But I think they are pretty! Melt them in the microwave and do this. How YUMMY do these look?!! Truth be told...my apples make for amazing pies but I didn't know if they would be good for these. BUT I am eating one right now and they are so YUMMY!!! Here's a set of mini cards I made using Mini Message - Happy Haunting. It's a clear set of 7 images, 2 circle word frames and many mini sentiments. Adorable stamps! See you all tomorrow for another go at the sneak peeks!! Have a great day! Is it just me or did the month since the last release just fly by??!! Oh well, it's a good thing because I got to play with some reeeaaaally cute new Elzybells. The stamps for this month consists of Halloween, Christmas and some miscellaneous stamps great for every day cards. I LOVE them all!! I have a few items to share with you today. This bag of caramels would be perfect to give to my dad~~~except for the fact that my mom would take them away from him and tell him he doesn't "need" them. LOL. I used a new sentiment for the tag. The little spider is part of a new clear set too. I so love this little Elzy in her pumpkin costume. So sweet. Here's a close up to show that I paper pieced her costume. The trick or treat border stamp along the bottom of the card is a new release too! Thanks for stopping by. Please go check out what Elizabeth and the rest of the DT have to share today. I'll see you tomorrow with more schtuff! Hi Ya! It's Elzybells challenge time. This one was a toughy but goody. Here's the challenge as written by Steph. Take one of your stamps and alter the image in someway eg. I did a halloween bag last year using yoyo boy but holding a spider where the yo yo was! You could add a handdrawn image to a design or mask a design to change it. I remember 'Cookie' did a good one where she changed the bride and groom to Frankenstein and his bride for a halloween card! You can see Cookies Bride of Frankenstien here. Love it. On my card I took the Tree Landscape stamp and inked it up except for the little tree part. I then took the little house and sentiment from the Mini Messages - A Little Hello set and stamped it in place of the tree. How cute is that?!!! Fun schtuff! Be sure to check out the DT's challenge cards.